Julia McConnell, left, and Angel Suhrstedt check off the punch list before Monday’s opening of the Edmond Public Library. Jace Williams, 2 of Guthrie, looks out from his homemade police car at Waterloo Road Baptist Church’s Fall Frolic. 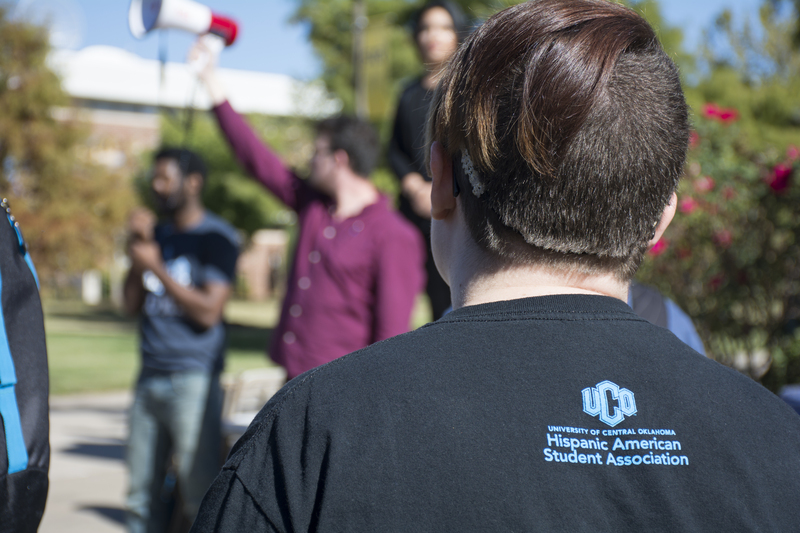 Protestor at the University of Central Oklahoma. Barbara Peak, 80 of Oklahoma City, and Ethan Pham, 4 and in Pre-K .
Romeo, 5, with Caroline Smith, 15 months in background. Kendall McDaniel, a cheerleader with the University of Central Oklahoma, dances with the school’s mascot. Stockton Duvall, UCO student, and Maddyson White, fourth-grader at Westfield Elementary.